William Pesek, a prominent Bloomberg columnist, wrote recently that the global outcry over the loss of flight MH370 has highlighted the country’s deepest flaws of incompetent people running the country. “The fumbling exposed an elite that’s never really had to face questioning from its people, never mind the rest of the world. The country needs nothing less than a political revolution,” said Pesek. And I agree. Nothing will change until the present political elite is made to pay for their ineptitude, incompetence and crooked ways by Malaysian voters. At the international level, our political leaders will have to take the blame. 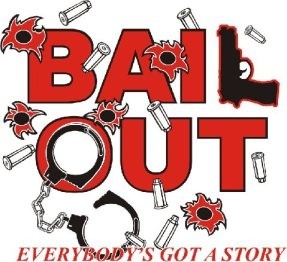 At the national level, we are facing a crisis of our public institutions being headed by not just mediocre and incompetent people but also characters who are downright dishonest and who abuse the system with impunity– the rogues in government. That brings me to the news reports of this morning that my young friend, Lawyer Rosli Dahlan, has again won another case against A-G Gani Patail. For my readers’ convenience I have reproduced only the MKini report by Hafiz Yatim (below) that provides interesting links on this story that never ceases to inspire me. It’s a sad story of how on the eve of Hari Raya 2007, Lawyer Rosli Dahlan (right) was brutally arrested in his office in full view of his staff by the ACA (now MACC). He was then charged in a most sensational manner to deceive the public into believing that Rosli had hidden illegitimate assets belonging to the Director of Commercial Crimes, Dato Ramli Yusuff, in another sensational story fanned by the media dubbed as the “The RM 27 million Cop”. All this was part of a conspiracy to eliminate Dato Ramli from the PDRM as Dato Ramli posed a threat to then IGP Musa Hassan and A-G Gani Patail. 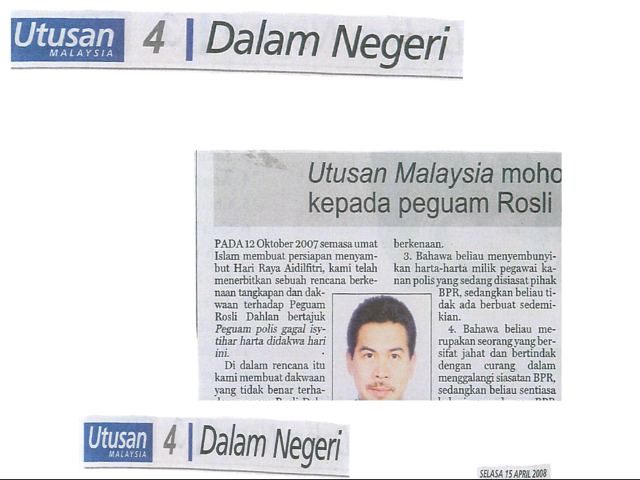 Rosli was made a victim because he dared to defend Dato Ramli despite warnings having been sent to him. Since then, Musa‘s former ADC had sworn a Statutory Declaration to expose IGP Musa Hassan’s links with the underworld. A lot more was also disclosed about A-G Gani Patail’s association with shady corporate figures like the one in the Ho Hup Affair. The Internet was also abuzz with stories about how A-G Gani Patail went to Haj and had his son to share a room with a shady former Police Inspector who was once charged for corruption, Shahidan Shafie, a proxy of former MAS Chairman Tan Sri Tajudin Ramli. 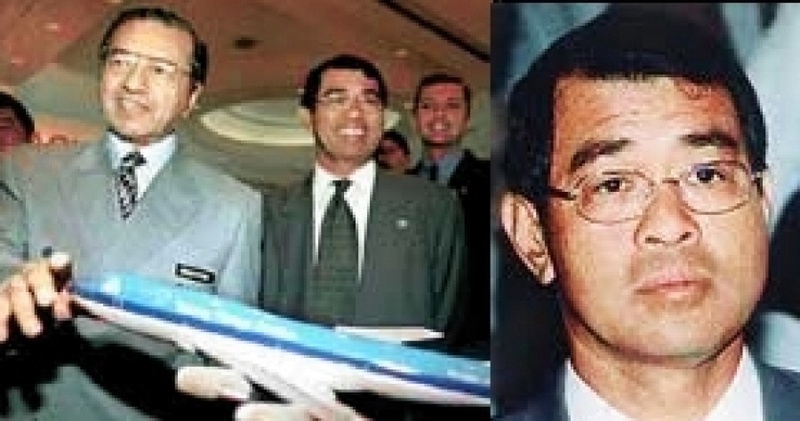 Tajuddin Ramli and the MAS saga was among the many failures of Dr Mahathir’s Bumiputra corporate advancement project which culminated with MH370 disaster. The latest episode could sink MAS without tax-payers bailout forthcoming . That explains why A-G Gani never charged Tajudin Ramli for the losses of RM 8 billion that MAS suffered despite recommendations by Dato Ramli Yusuff. Dato Mat Zain Ibrahim, former KL OCCI also swore SDs about A-G Gani Patail throwing away the Batu Putih case for pecuniary gains. Yet Gani Patail remains as the A-G of Malaysia, leading many to speculate that he has a grip on PM Najib Razak because of Razak Baginda’s acquittal in the murder of the Mongolian beauty, Altantuya Shariibu. In that case, the A-G did not appeal against Razak Baginda’s acquittal. On the other hand, the A-G has pursued criminal appeals against certain people like Lawyer Rosli Dahlan and Dato Ramli Yusuff (left). In the PKFZ case, A-G Gani Patail charged and appealed against the acquittal of Tun Ling Liong Sik which led to Tun Lingcalling him – “ That Stupid Fella”. Back to Rosli’s case. Lawyer Rosli, he has fought a long and lonely battle, winning his acquittal and then suing every one of the mainstream media for defaming him – Utusan Malaysia, The Star and the NST, and winning against them one by one very patiently. 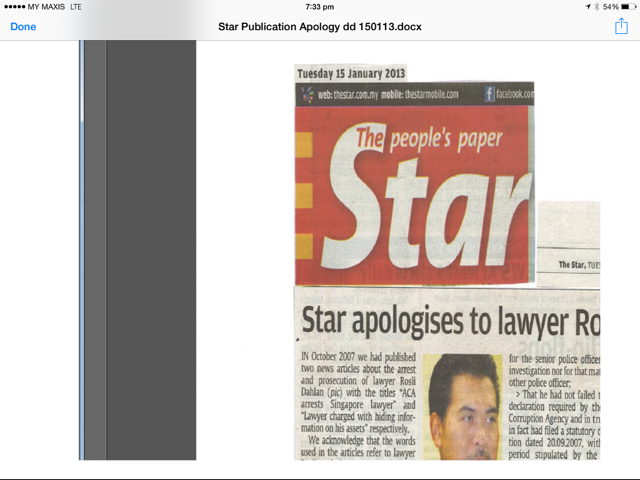 On January 15, 2013, the Star paid damages and admitted to its wrongdoings in a published public apology. On October 18, 2013, the KL High Court found the NST and the MACC guilty of defaming Rosli and ordered them to pay damages of RM 300,000 and costs. This made history as it was the first time that the MACC was sued by a person and the MACC lost and had to pay damages. Last year Rosli sued A-G Gani Patail, MACC Chief Commissioner Tan Sri Abu Kassim and several other MACC officers for conspiracy, false and malicious investigation, abuse of power, abuse of prosecutorial discretion, malicious prosecution, prosecutorial misconduct and public misfeasance. Read the MKini report below and you will discover that A-G Gani Patail had engaged Tan Sri Cecil Abraham , a senior private lawyer from Messrs ZulRafique & Partners (an UMNO law firm) to defend him, the A-G Chambers (A-GC) and the MACC. I find that surprising since I am told that the A-GC has over 800 lawyers, making the A-GC the “largest law firm” in the country. By contrast, I am told that the largest private law firm in the country has a maximum of 140 lawyers. Putrajaya needs to review its policies as it can’t afford to spend taxpayers’ money on the AG’s own legal problem. That means the Government of Malaysia spends millions of ringgit to staff the A-GC in order to defend the government. Yet when the Government is sued, A-G Gani Patail engages private lawyers. Does that makes sense to you? Is A-G Gani Patail admitting that he is not confident of the A-GC, which he heads, to defend him and the government in the face of the law suit by Lawyer Rosli Dahlan? Is A-G Gani Patail admitting that the A-GC is incompetent? Was that why Tan Sri Shafee Abdullah was asked to be an ad hoc DPP to prosecute the appeal against Dato Seri Anwar Ibrahim? Or is there is a commercial logic to that? Is A-G Gani Patail outsourcing legal work to his friends in the private sector to reward them for covering up for his misconduct and incompetence? Cecil Abraham sits in the MACC’s Operations Review Panel. I had a chat with Tan Sri Robert Phang who has always been critical of A-G Gani Patail. He told me a more worrisome story. Robert Phang questioned whether Tan Sri Cecil Abraham (right) is a fit to lawyer to defend the A-G because Cecil Abraham sits in the MACC’s Operations Review Panel, which advises on oversights in the MACC. One of the committee’s functions is to ensure that the MACC and other government agencies do not commit abuses. It is like an Ombudsman. 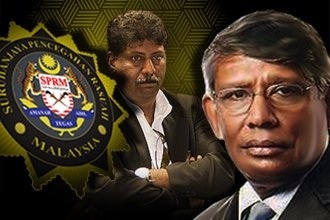 If so, how can Cecil Abraham defend A-G Gani Patail and the other MACC officers whom Rosli has accused of fixing him? Is that not a conflict of interest? Other lawyers tell me that Cecil Abraham is the senior lawyer implicated in the PI Bala SD case over the Altantuya murder. I am stunned by all these revelations. It seems that all the committees and advisory panels in the MACC and other government agencies are to cover up for their wrongdoings rather than to expose and correct them. No wonder our country is headed for doom ! Americk Sidhu, PI Bala’s lawyer makes a startling revelation at the Bar AGM that Cecil Abraham confided in him that he prepared the 2nd SD on instructions from Najib. I am told that Rosli’s Statement of Claim against A-G Gani Patail contains very damning revelations about A-G’s misconduct. I am told that with every victory that Rosli gained against A-G Gani Patail, more and more civil servants and people are coming up to him to offer assistance and being more willing to be witnesses in his cases. This was unlike before when many were afraid to be associated with him. Is that why AG Gani Patail does not want to go to trial and employ all kinds of delaying tactics in Rosli’s suit against him. Is that why A-G Gani Patail engaged Tan Sri Cecil Abraham to strike out Rosli’s suit? 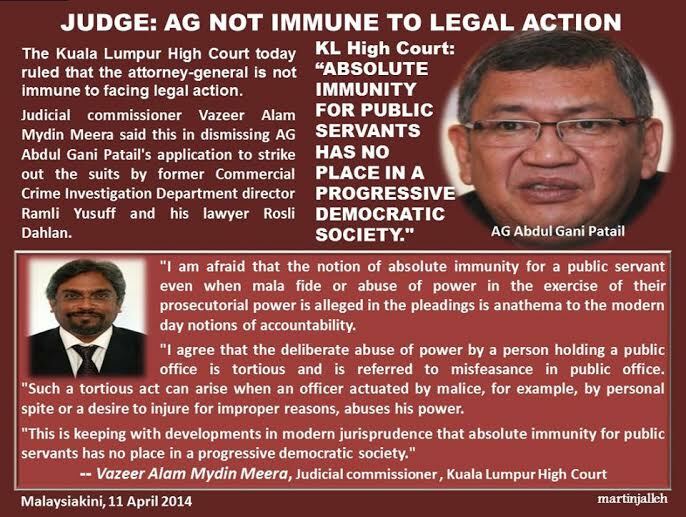 Otherwise, why is A-G Gani Patail so afraid to go to trial in Rosli’s case? But now that Tan Sri Cecil has lost this striking out application and the A-G is ordered to pay cost to Rosli, who is going to bear this cost? Should taxpayer’s money be used to pay for the misconduct of these rogues in government? If we taxpayers have to bear this cost, then A-G Gani Patail and the likes of him will never be repentant. There will never be accountability! In my view, A-G Gani Patail must bear the full costs of his misconduct. 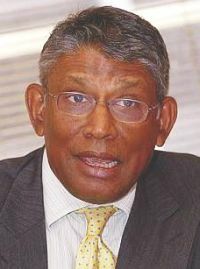 He must be held accountable and he must pay the legal fees charged by his friend Tan Sri Cecil Abraham. I am also of the view that the MACC should sack Cecil Abraham from being on its Advisory Panel. Cecil Abraham cannot sit there to pretend that he is acting as a check and balance against the MACC’s misconducts whereas he is also covering up for the MACC when the MACC is sued by Rosli, and getting well paid by the Government using tax payer’s money! The conflict of interest is so clear and it is appalling that a senior titled lawyer like Tan Sri Cecil Abraham cannot see that. I also feel that the Bar Council should not stand idle arms akimbo with this revelation. The Bar Council should subject Cecil Abraham to disciplinary proceedings for breaching such common sense rule on conflict of interests. Cecil has dishonored the Bar and the Council must act against him! In that regard, I must congratulate Judicial Commissioner Wazeer Alam Mydin for having a fair sense justice in not allowing A-G Gani Patail to strike out Rosli ‘s claim. A judicial Commissioner is basically a probationary judge. For a probationary Judge to do this means JC Wazeer is indeed a brave man who would not tolerate public authorities who commit abuses and then claim immunity. It is indeed a brave probationary judge to stand up to the A-G and tell it to the A-G’s face that the A-G is not above the law. The Attorney-General is not immune to legal action, the High Court in Kuala Lumpur ruled today. Judicial Commissioner Vazeer Alam Mydin Meera said this in dismissing Attorney-general Abdul Gani Patail’s application to strike out the suits by former Commercial Crime Investigation Department director Ramli Yusuff and his lawyer Rosli Dahlan. Public authorities who abused their powers have been “insulated” from accountability for “far too long” by using the Public Authorities Protection Act. 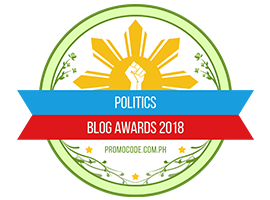 “I am afraid that the notion of absolute immunity for a public servant, even when mala fide or abuse of power in the exercise of their prosecutorial power is alleged in the pleadings, is anathema to modern day notions of accountability. “I agree that deliberate abuse of power by a person holding a public office is tortious and is referred to as misfeasance in public office. “Such a tortious act can arise when an officer actuated by malice, for example, by personal spite or a desire to injure for improper reasons, abuses his power,” Vazeer Alam said. “This is keeping with developments in modern jurisprudence that absolute immunity for public servants has no place in a progressive democratic society,” the judge added. The A-G and two other officers from the A-G’s Chambers were named in the respective suits filed by Ramli Yusuff and Rosli Dahlan. They had sought to strike out the suits on the grounds that they should be immune to such action in carrying out their prosecution powers. Ramli had filed a RM128.5 million suit against A-G Gani, former IGP Musa Hassan and several Malaysian Anti-Corruption Commission officers. Rosli had filed a separate suit amounting to RM48 million against the same parties.The two are suing them for abuse of power, malfeasance in the performance of public duty, malicious prosecution and prosecutorial misconduct, among others. Judicial Commissioner Vazeer Alam also ruled that the two suits for malicious prosecution were not filed out of time as this cause of action accrued upon the determination of the final appeal. He said that the court could not consider the period to be when Ramli or Rosli were acquitted, as there were subsequent appeals against the acquittals made after this. 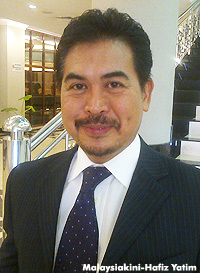 Vazeer Alam also allowed the two to name the MACC in their legal action, since the MACC took over from the Anti-Corruption Agency. Ramli had sued the defendants for their claim that he was the policeman in the Copgate affair and that he had RM27 million in assets. 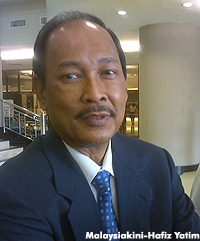 Subsequently, Ramli was charged with the non-disclosure of some of his assets and the case against him was thrown out. Ramli’s lawyer friend Rosli was also hauled up as a result of this. Ramli, who was a former state Police Chief for Pahang and Sabah, said in his statement of claim that his relationship with Gani soured in 2006. This was after he met then Prime Minister Abdullah Ahmad Badawi and recommended that former Malaysia Airlines chairperson Tajudin Ramli be prosecuted for the severe losses suffered by the company. “But the A-G decided not to prosecute Tajudin. I even told the PM then that if the AG was reluctant to prosecute Tajudin, the CCID would have the necessary resources to conduct the prosecution. “This earned me Gani’s permanent displeasure…” Ramli said in his statement of claim. After today’s court session, Ramli commended the judge for his brave decision. “I am not doing this for Ramli Yusuff but for the Police Force, some of whom have been victimised as a result of this. And I am also doing this for the serving government officers who have also been victimised. “I am also seeking closure to an event that has affected my possible career advancement,” he said. The RM27 million investigations had hindered his promotion to be the Inspector-General of Police, he added. This post was subsequently handed over to Musa Hassan. Rosli, on commending today’s High Court decision, said abuses by the public authority have for too long been insulated by invoking the Public Authority Protection Act. “Today, a brave judge has declared that absolute prosecutorial immunity is anathema to the modern concept of democracy. This is to remind the public authorities that no one is above the law,” Rosli said. 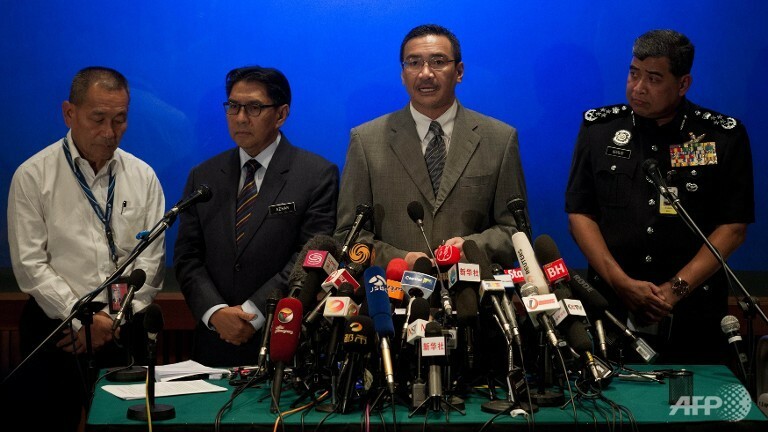 Several Police Officers under Ramli’s charge have also been prosecuted as a result of the Copgate affair and all of them have acquitted and have been reinstated to their posts during former IGP Ismail Omar’s tenure. Ramli was represented by Harvinderjit Singh, while Chethan Jethwani and Darvindeer Kaur appeared for Rosli. Senior lawyer Tan Sri Cecil Abraham, Rishwant Singh and Senior federal counsel Dato Amarjeet Singh represented the defendants. Vazeer fixed June 18 for case management to possibly fix trial dates for the hearing.